Ski gear is pricey. You have to cut corners and find deals when you can. That's why I found a pair of tech boots in the bargain barrel this season. They were light, had great reviews, and they were cheap. But I ended up paying another price. By my third run it felt as though I stepped into a bear trap. Friends on the mountain told me to talk to Rick Chatham, our resident Boot Guru at the Alpine Shop on Schweitzer Mountain. He hates that nickname, but doesn't mind calling himself a master boot fitter. Rick knows having well-fitting boots matters. "They are the single most important piece of the equation," he says, adding that skiing without good boots would be like "having a computer without a keyboard." The boot doctor is in with eight tips for selecting new boots. Look for a place with a good reputation and knowledgeable staff. According to Chatham, if they start throwing boots on your feet without looking at your foot or fitting it to the shell first, you should run out the door. A good boot fitter will take a look at your foot and stance first before fitting you into the shell of the boot. In the shell, there should be one and a quarter inches behind the heel with the toes touching the front of the boot. If it looks promising, then you'll get into the boot with the liner. Let your foot sit in the liner to warm it up, and then only lightly buckle your boots. Chatham says a lot of skiers over buckle their boots, causing issues for your feet. In the shop you want to see the boot flex to ensure you have proper mobility. 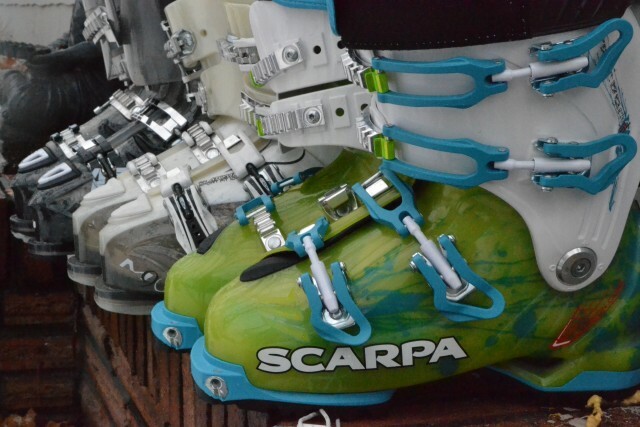 Boots become 20 percent stiffer once outside, so if they're not moving in doors you'll be hurting on the slopes. You don't have to throw down on the most expensive boots out there, but remember you get what you pay for. Prepare to take the plunge and spend the money necessary to get the boot that fits your foot and skiing style best. Take your new kicks for a spin and pay attention to any discomfort on a scale of one to five. One means it lightly pinches your skin and five means the pain is like a finger in your eye. Levels one and two are expected when breaking in new boots, but any pain greater than that means a return to the shop. Take your boots back to your trusty boot guy or girl and confess any issues you may have. They'll be able to cook the liners to customize the fit, adjust the shell to better fit your foot, and tinker around with the foot bed. The internet is great. Our Gear Guide is greater. But real people are greatest.